Heart Disease Prevention & What You Can Do to Stop Early Heart Disease? Today is which is a good time to start thinking about ways to lower your risk for early heart disease and heart attack. Basically all people can implement steps to lower their risk for early heart disease and heart attack. High blood cholesterol is a major risk factor for the onset of early heart disease. Preventing and treating high blood cholesterol includes eating a diet low in saturated fat and cholesterol and high in fiber, keeping a healthy weight, and getting regular exercise. All adults should have their cholesterol levels checked once every 5-years, or more frequently. If yours is high, your doctor may prescribe medicines to help lower it. Lifestyle actions such as healthy diet, regular physical activity, not smoking, and healthy weight will help you to keep normal blood pressure levels and lower heart risk, and risk of a stroke too. All adults should have their blood pressure checked on a regular basis. Blood pressure is easily checked. If your blood pressure is high, you can work with your doctor to treat it and bring it down to the normal range. A high blood pressure can usually be controlled with lifestyle changes and with medicines when needed. People with diabetes have an increased risk of heart disease but can reduce their risk. Also, people can take steps to reduce their risk for diabetes in the first place, through weight loss and regular physical activity. Smoking increases the risk of high blood pressure, heart disease, and stroke. Never smoking is one of the best things a person can do to lower their risk. And, quitting smoking will also help lower a person's risk of heart disease. A person's risk of heart attack decreases soon after quitting. If you smoke, your doctor can suggest programs to help you quit smoking. Excessive alcohol use increases the risk of high blood pressure, heart attack, and stroke. People who drink should do so only in moderation and always responsibly. Healthy weight status in adults is usually assessed by using weight and height to compute a number called the "body mass index" (BMI). BMI usually indicates the amount of body fat. An adult who has a BMI of 30 or higher is considered obese. Overweight is a BMI between 25 and 29.9. Normal weight is a BMI of 18 to 24.9. Proper diet and regular physical activity can help to maintain a healthy weight. Adults should engage in low to moderate level physical activities for at least 30-minutes on most days of the week. We suggest 6 out of 7 days, with 1 day of rest. Along with healthy weight and regular physical activity, an overall healthy diet can help to lower blood pressure and cholesterol levels and prevent obesity, diabetes, new heart disease, and stroke. This includes eating lots of fresh fruits and vegetables, lowering or cutting out added salt or sodium, and eating less saturated fat and cholesterol to lower these risks. The Seventh Report of the Joint National Committee on Prevention, Detection, Evaluation, and Treatment of High Blood Pressure from the National Heart, Blood, and Lung Institute Web site. Third Report of the Expert Panel on Detection, Evaluation, and Treatment of High Blood Cholesterol in Adults (Adult Treatment Panel III) from the National Heart, Blood, and Lung Institute Web site. This report brings together, for the first time, what has been learned about physical activity and health from decades of research. 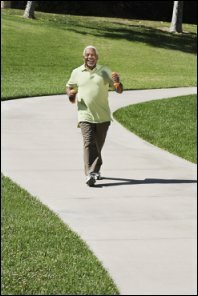 The guidelines provide science-based guidance to help Americans aged 6 and older improve their health through appropriate physical activity. List of reports concerning smoking and health, including reports on tobacco use among ethnic groups and young people. Dietary Guidelines for Americans is published jointly every 5 years by the Department of Health and Human Services (HHS) and the Department of Agriculture (USDA).